"How I envy you your beauty and your sweet scent! No wonder you are such a universal favourite." Looking to add some more leafy greens to your diet? Greeks generally consume more leafy greens, vegetables, and fruits than all other Europeans. Wild greens in particular are quite popular throughout Greece and this has led to the semi-domestication of certain species. 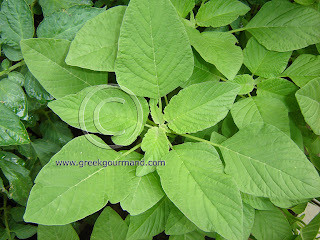 One of my family’s favourites is Amaranth, or more colloquially known as “vlita” in Greece [Gr. βλήτα pronounced ‘VLEE-tah’]. The name Amaranth comes from the Greek amaranthos (αμάρανθος) the "un-withering," or “fadeless” (flower). Associated since the most ancient times with the goddess of the hunt, Artemis, the amaranth grows like a weed throughout Greece; both on the mainland and throughout the islands. Though, regional differences in referring to species of this wild herb ascribe different names to it, for instance, on the island of Kefalonia a mottled-leaf species of vlita is referred to as papagalos (παπαγάλος) or “parrot”. Suffice it to say, the term vlita is all you need to remember should you ever wish to find some anywhere in Greece. Many families, my own included, actively cultivate amaranth in our kitchen gardens, as it is a truly wonderful accompaniment for some grilled fish, or to have on its own as a salad or vegetarian entree. Typically, my family and most others from Arcadia, will eat vlita blanched and drizzled with some olive oil, lemon juice or vinegar, and sprinkled with salt, oregano, and pepper; with perhaps some chopped garlic thrown in as well. On the other hand, my wife’s family which is from neighbouring Laconia, enjoys vlita with a helping of a traditional garlic sauce called Scorthalia [Gr. Σκορδαλιά pronounced ‘score-thal-YA’]. As this recipe is the Laconian version of a vlita salad it therefore requires a recipe for Scorthalia. Now, traditionally speaking, Scorthalia can be made with ground walnuts or almonds, or simply with day-old bread soaked in water and squeezed out. 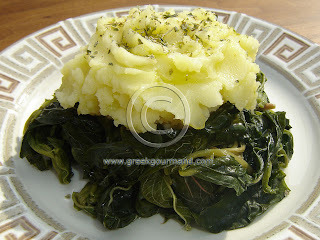 Since the introduction of the potato to Greece, Scorthalia has also been made with mashed potatoes. This recipe will detail the potato version of Scorthalia and I will share the other versions some other time. Fill a medium sized saucepan with water (3/4 or so full) and a dash of salt, place on stove and bring to boil. Cut potatoes into eighths and add to boiling water. Boil potatoes until soft then drain them and put them in a medium to large sized mixing bowl. Using a potato masher, or a large fork, proceed to thoroughly mash the potatoes. Once potatoes have been mashed, add the pressed garlic, along with the olive oil, vinegar, salt and pepper, and resume mashing and stirring to incorporate all the ingredients. Try to ensure that there are no lumps of potato remaining in the mix. When a uniform and creamy state has been achieved, set the Scorthalia aside. Soak amaranth leaves and shoots for about 15 minutes in cold water, then rinse them off and set aside. Add amaranth leaves and shoots to the pot and boil for 5-8 minutes until the leaves are a dark green colour and the shoots are noticeably tender. Remove from pot, and place in a colander, run under a stream of cold water, and then set aside to drain for 15 minutes. Serve vlita with a dollop of Scorthalia overtop, and then add a sprinkling of dried Greek oregano and a drizzle of olive oil as garnish. Enjoy this vegetarian Greek food recipe on its own or serve it alongside some grilled fish, either way it will satisfy the palate and appetite. Here in Canada, we have rather limited choices when it comes to Canadian cuisine per se. Instead, Canadians are quite well exposed to the whole gamut of ethnic foods that arrived -and continue to arrive- with the polyglot immigrant populations who call Canada “Home” (which is everybody but the Native Peoples). In fact, about the only Canadian dish I can think of is Poutine and that is originally from Quebec, the Francophone part of the country. To be honest, I was never very fond of Poutine. Perhaps it is the gravy, or the tasteless cheese curds, or the sloppiness of the dish which turned me off, I really do not know what it is, but I have never liked it very much. However, as I was helping my sister and brother-in-law to move the other day, I found myself out in rural Ontario and needing a quick fix for my road hunger. Sure enough, a sign advertising “Fresh Cut Fries – Poutine” appeared by the side of the road many miles from anywhere and I stopped to re-fuel. Now, don’t get me wrong, I have tried to like Poutine and so I resolved to give the stuff another go and ordered a small size serving. I ate it, but I did not particularly like it, I simply consumed it to fill the void in my stomach. Let me assure you that I am not in any hurry to have Poutine again any time soon! This Feta Fries recipe is my Greek food answer to Quebecois Poutine. The beauty of this particular recipe lies in its simplicity. I have heard of people adding gravy or mayonnaise or sour cream, or yogurt in similar recipes but take my word for it; they are missing the point entirely. There are only five required ingredients for this dish: potatoes, Greek feta cheese, dried Greek oregano, cooking oil, and some fresh lemon juice and that is all! 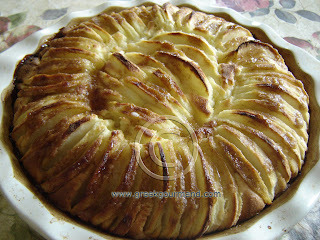 First off, Greeks do most of their frying in olive oil; this includes the frying of potatoes. Chips done in Greek olive oil are nothing like fries cooked in vegetable oils. Admittedly, the cost of Greek olive oil may be prohibitive in this respect, but if you can use it exclusively you will taste the difference. In point of fact, I often use an admixture of Greek olive oil and peanut oil when frying potatoes at home. I find peanut oil the most amenable to this task as it does not affect the flavour which the olive oil imparts to the fries. With respect to quantities, I would go with a 50/50 olive oil to peanut oil ratio. Finally, you must use a good quality Greek feta cheese (which is made from ewe’s milk and can contain up to 30% goat’s milk). In contradistinction to the tasteless cow’s milk cheese curds the Quebecois use in their Poutine, Greek feta cheese adds a fresh salty flavour which mingles incredibly well with the lemon juice and oregano sprinkled overtop of the fries. All in all, I think it is safe for me to say that although my Feta Fries are essentially a Greek fast food, they are a much healthier and more flavourful alternative to more common convenience foodstuffs. Trust me... they will be the most popular thing on the table! Total time to prepare is 15 – 20 minutes. Heat oil in a large frying pan to 180° C (350° F). Add the fresh cut fries to pan and cook until done. Make sure to turn the fries a few times with a spatula, and to slightly swirl the pan occasionally to allow the fries to settle in order to ensure an even and thorough cooking. Stay on top of them as you do not want to overcook them. Crispy edges are fine but thoroughly saturated and darkened crisps are not. When cooked, remove fries from oil and set aside to drain on some paper towel for a couple minutes. 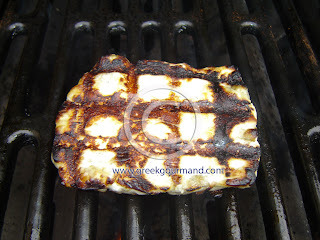 If you have not already done so, crumble the feta cheese and turn on your oven broiler to the High setting. Place drained fries in an oven-proof serving plate (or platter) and sprinkle the crumbled feta cheese overtop of the fries to cover. Remove platter from oven (using oven mitts!) and place it on a heat-resistant surface or cooling rack for serving. 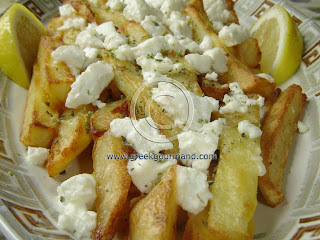 Sprinkle the dried Greek oregano along with the juice of ½ a lemon on top of the feta fries and serve hot. Recently, I had the pleasure of conversing with Chef Mark Tafoya of the Culinary Media Network about Greek cheese plus a few other related topics. The audio file can be heard or downloaded at Chef Mark's ReMARKable Palate web site. Click here visit the episode page and listen to our chat. Apples are among the earliest fruits known to Europeans. The ancient Greeks have left us numerous references to the apple both in literary and philosophical sources. According to a couple of accounts, it was the god Dionysus who first introduced the apple to mortals. The apples from a town called Sidus, near the ancient city of Corinth were among the most prized of antiquity. Today, Greek apple farming takes place largely in central and northern Greece, especially around the village of Zagora on the slopes of Mt. Pelion, and in the vicinity of the city of Kastoria in Macedonia. Some apple farming also takes place near Tripolis, a city in the central part of the Peloponnese. The apples of all three areas are registered as Protected Designation of Origin (PDO) / Protected Geographical Indication (PGI) products of Greece by the European Union. “Apples Kastoria” (Μήλο Καστοριάς) are especially prized for their flavour. Greece produces nearly double the amount of apples per capita (33.4 kg.) than the United States (18.4 kg. )¹, so there are more than enough apples to go around and Greeks consume them liberally. 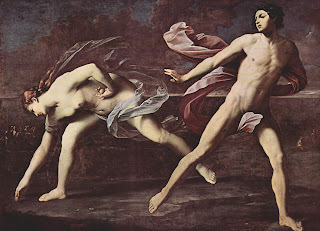 Atalanta and Hippomenes, by: Guido Reni c.1612. A veritable orchard of discord was sown by Priam’s son, Paris, who granted a golden apple to Aphrodite in the first beauty contest on record. Zeus had appointed Paris as the judge for a beauty pageant between three goddesses: Aphrodite, Athena, and Hera; and instructed him to choose the fairest by awarding the aforementioned apple. As a reward for his choosing her, Aphrodite promised Paris the most beautiful woman in the world (who also happened to be another man’s wife): Helen of Sparta. It was this event which ultimately launched a thousand ships to reduce the city of Troy. This is also the origin of the phrase “Apple of Discord” (μήλο της Έριδος) which is a euphemism that is used to refer to the root or crux of an argument or dispute. Moral of the story: It is generally not a good idea to make too public a declaration of your preference for one form of beauty over another. After all, who wants another Trojan War?! 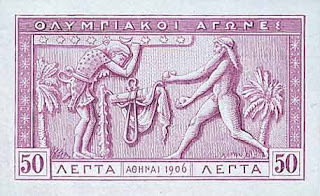 Greek postage stamp commemorating the Athens Olympic Games of 1906 depicting Hercules (left) and Atlas (right). 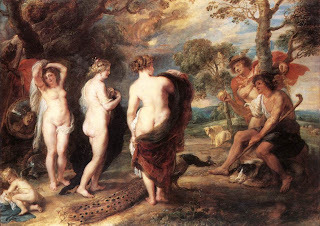 As part of his Twelve Labours, the demi-god Hercules was charged by King Eurystheus with the task of stealing the golden apples that grew at the western edge of the world in the orchard of the goddess Hera; which was tended by the nymphs known as the Hesperides. The golden apples were guarded by a hundred-headed serpent named Ladon who never slept and lay with his body curled about the tree upon which they grew. The Titan known as Atlas was also stationed nearby, straining under the burden of the earth and sky which he bore upon his shoulders as eternal punishment for waging a war (known as the Titanomachy) against the twelve Olympian gods. After a number of memorable adventures and a journey of a couple months, Hercules made it to the garden of the Hesperides and slew Ladon with an arrow. Whereupon, he enlisted the aid of Atlas to retrieve the golden apples for him, as he did not want to offend Hera directly by picking them himself. Atlas was only too happy to oblige, provided that Hercules agreed to shoulder the weight of the earth and sky in order to free him up for the caper. Hercules accepted the deal and took up the load while Atlas skipped off to pluck the golden apples. The deed accomplished, Atlas returned to smugly inform Hercules that he had decided to deliver the apples himself to King Eurystheus, leaving the hero to continue bearing his enormous encumbrance in the meantime. Suffice it to say, this development did not please Hercules who was already straining under the unaccustomed load of the Titan’s crushing burden. Begging Atlas’ assistance to rearrange the load on his shoulders and to cushion it with some padding, Hercules managed to fool him and slipped the giant load back onto the shoulders of the Titan. Whereupon, he picked up the apples along with his gear, bade Atlas adieu, and set off for the court of King Eurystheus to deliver the rare fruits. Moral of the story: Sam should not take it upon himself to write lengthy blog posts while his wife is packed and waiting for him to leave for a week’s much deserved vacation in Muskoka(!). Oh, and I almost forgot the recipe! Clever fellow that I am, I made this ornamental dessert as an offering for my wife’s birthday; it was an unforced labour of love in the interest of ongoing harmonious relations. [Grin.] Needless to say, my skill as a cook was likely one the reasons my wife even considered marrying me in the first place. Sigh… Oh well, we all have our burdens to bear! Isn’t that right, dear? When all is said and done, my wife is the apple in my pie. Happy Birthday Sweetie! (She hates it when I call her that.) LOL! 1. Peel and core the apples and slice them into sixteenths and set them aside in bowl of water with some lemon juice squeezed into it to keep the apple slices from browning. 2. Sift flour with salt (and the baking powder if required). 3. Using a mixer, cream a ½ cup (125 ml.) of the butter and the 1 cup (250 ml.) of white sugar until smooth. 4. While continually mixing, add the egg yolks one at a time alternating with a tablespoonful (15 ml.) of flour in between yolks to achieve a smooth and creamy consistency in the mix. 5. Add the rest of the flour in stages, alternately adding the milk in stages as well. Then add the vanilla extract and lemon rind and mix until the batter is smooth. 6. In a separate mixing bowl, whip the egg whites into stiff peaks and then using a spatula, carefully fold them into the batter. 7. Butter the sides of a pie baking dish and pour in the finished batter. 8. Arrange the apple slices in a perpendicular fashion overtop of the batter in a circular pattern to form an outer ring of apple slices (as pictured in the first photo above). Fill the center of the ring with any remaining slices. 9. Melt the remaining ¼ cup of butter along with the ¼ cup of brown sugar, mix in the cinnamon and pour the mixture over the apple slices in a circular fashion, making sure to distribute it evenly in a long even stream. 10. Place baking dish in an oven pre-heated to 350° F. (180° C.) and bake for approximately 60 minutes. Let the Milopita stand to cool for at least a couple hours before serving.